There is something infinitely charming and special about young men who have a passion in life. I may be a particularly soft touch, being female, but when you meet a man such as Patrick Maurel you can't fail to be charmed by his passion. He's a self-professed paysan, a viticulteur who owns a vineyard beneath the Pic St Loup at Mas de Londres. He is passionate about his wine and has pursued, since 1990 a rigorous approach to his organic wine production. Not only are the vines cultivated organically, but the vinification is also carried out to the highest standards of natural production. We had a good chat to him at the Viols le Fort fête and tasted his red wine. It is light and delicious, has a flavour unadulterated by yeast which allows the natural aromas of the grape to emerge freely. He uses cépages from a bygone era: Carignan, oeillade, merlot, Aramon, cinsault. Nettles are grown alongside to regulate the iron in the soil. Sheep crop the grass between the vines allowing the soil to maintain its microfauna and enable the vines to grow as nature intended. His tractor has not emerged from the shed in months, and he does all the work himself. 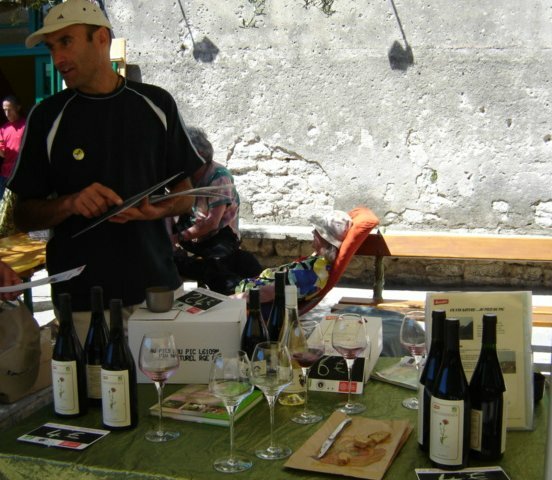 He sells his wine at a measily 4€ per bottle because he wants to provide wine for all those who appreciate his methods. Thus his client base has both the earnest young who are in search of organic products of all sorts as well as the more discerning older mob. If you are ever out walking at the Pic St Loup, you will pass in front of his vineyard. Go there in the autumn and you can taste his grapes confident that they have not been sprayed with copper sulphate. For those interested, he can be found at m.maurel@wanadoo.fr, Domaine de la Liquière, 34380 Mas de Londres. 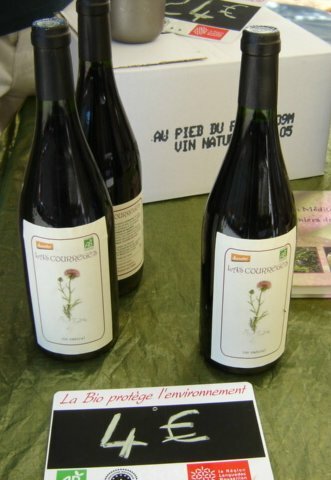 Certified AB (Agriculture Biologique) Ecocert sas F32600 and Demeter (organic from start to finish). The man's as authentic as they come. A dégustation will have you hooked.